it all comes down to this, originally uploaded by jahansell. After a year or more of campaigning, it all comes down to this! We've gone through so many different ways to vote - it's kind of funny that we're back to a paper ballot! For most of my adult voting life I voted in a booth where the names of the candidates were posted next to levers - you'd pull a large lever to close the booth curtain, then set the small levers to the candidates you wanted. When you pulled back the large lever again, the curtain would open and your vote would be registered. Then, after the 2000 election and all teh controversies with ballots that couldn't be read or registered, many states, including this one, began to look at other ways of recording votes. ATM-machine like terminals have been tried, but there have been many security flaws exposed in the software. 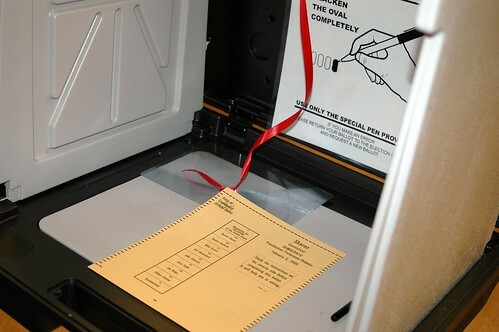 This is the first time we've used these paper ballots - they are inserted into an optical scanner. However I happen to know already that there were some errors tallying the vote last night - an individual I know voted for a rather obscure candidate (Mike Gravel) but on the totals for Sharon as of last night at 11pm, Gravel received 0 votes! Conspiracy theorists, start your engine! You just satisfied my curiosity: now I know how voting looks like here. I am suprised that it is still with a good ol' pencil. Glad you voted!